On Thursday 27 September the 2018 ACU - Brisbane Scholarship and Award Luncheon took place at Portside, Hamilton. 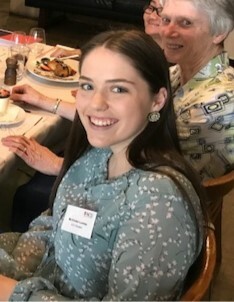 The Catherine McAuley Scholarship, established by the Sisters of Mercy Brisbane Congregation in 2006, was presented to Ms Kristen Lunney a past pupil of St Mary’s College Ipswich. Kristen is in the first year of her primary teaching course. The scholarship will alleviate for her and her family some of their financial concerns surrounding accommodation and rent, travel and the purchase of resources. Kristen expressed to the Sisters of Mercy present on more than one occasion her deep gratitude for this scholarship and her understanding of Catherine McAuley and the empowerment of youth through education.